Help CentreUsing SuperControl Managing housekeepingHow do I add my housekeepers? 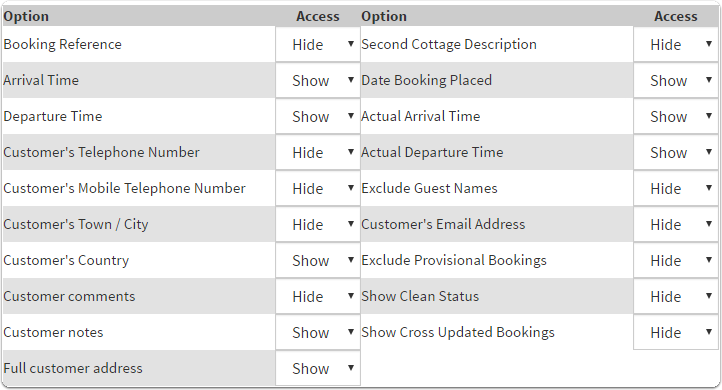 If you have housekeepers, it is a good idea to provide a log in to the Housekeeper log in area. When the housekeeper logs in, they can see arrival times to help them prepare for guests, and run off arrival/departure reports. 1. Go to Admin > Housekeepers > Add Housekeepers. 2. Add your housekeeper's details (add an email address and password in order to provide them with a login). Setting a password for your housekeeper will allow the housekeeper to log in to their own Housekeeping area using log in details. Tick "Send email alerts" and this will automatically trigger a notification email to a housekeeper once a booking has been placed. It will include limited details of the booking (booking number, lead guest name, number of people, property, booking status and dates). Tick "Send email alerts when bookings are cancelled" to trigger an email to the housekeeper once a booking has been cancelled. Please note that you should allocate the housekeeper to your property before sending log in details otherwise they won't be able to view anything. Click here for instructions to allocate a housekeeper to your property. Prev: How can I add special pricing? Next: How do I allocate a housekeeper to a property?